CHI 2019 is sponsored by the Association for Computing Machinery’s (ACM) Special Interest Group on Computer-Human Interaction (SIGCHI). 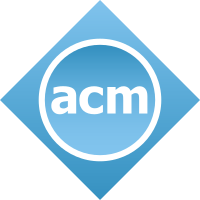 ACM is an educational and scientific society uniting the world’s computing educators, researchers, and professionals to inspire dialogue, share resources, and address the field’s challenges. ACM offers its more than 100,000 worldwide members cutting edge technical information through world class journals and magazines, dynamic special interest groups, and globally recognized conferences. Visit www.acm.org for more information about ACM. SIGCHI is the second largest of the ACM’s 26 special interest groups. It is the premier international society for professionals, academics, and students who are interested in human-computer interaction (HCI). It provides a forum for the discussion of all aspects of HCI through its conferences – 24 sponsored conferences including the flagship CHI conference – and its publications, websites, email discussion groups, and other services. It advances education in HCI through courses, workshops, and outreach, and promotes informal access to a wide range of individuals and organizations involved in HCI. Members can also be involved in HCI-related activities with others in their region through a local SIGCHI chapter. Come to the SIGCHI Town Hall meeting on Wednesday at 12:20-14:00 in the Lomond Auditorium or visit www.sigchi.org to learn more about SIGCHI. The website also has an active blog where many announcements and calls for volunteers are posted. There is also a SIGCHI Youtube channel www.youtube.com/user/acmsigchi where recordings from this conference as well as prior conferences and events are posted. Write: Association for Computing Machinery, Inc.